Well, it's Monday. It's also JUNE! Can you believe it? I don't know about where you live - but it's HOT here! I think we hit around 88 today! Summer has come! And I love it. Tonight I cooked one of our favorites, chicken supreme, for dinner. Then I settled down to address invitations for a wedding shower we are throwing at my house for my friend Hillary. This is what the invite looks like (only black writing) but obviously not the correct information. I didn't think it was wise to put that all out here in case any of you are crazy. ha! I watched the Bachelorette while I wrote the invites out - always entertainment. My best friend Laurie is ready to have her baby any minute and she called tonight to see if I REALLY wanted her to call me when she went to the hospital even if it was 2 a.m. I understand - I don't like calling people at any time (it makes me nervous) and I doubt I could call anyone at 2 a.m. But we are practically sisters and I want to be there when the baby comes so I told her to call. Did you call people outside of family when you went into labor - if it was the middle of the night???? Finally - sweet Judy over at Gracious Southern Living gave me a blog award today. What an honor!! I wanted to give it back out but my problem is that seriously I could not choose. I was going down my list of links and I love every one of them equally and there are so many of you that I read that aren't on my links who I adore. I just can't pick one or even a few. I think it's so neat that Laurie will call you if she goes in during the middle of the night! We didn't face that issue since I was induced both times. I haven't experienced the 2 a.m. "is it time?!" labor pains. (Not complaining--I prefer the planned route!) I can't wait to see a picture of Laurie's baby! MMM! Chicken Supreme is so yummy! Addressing those invitations must have been fun! Those are cute! Oh I am ready for Laurie to have her sweet baby also! Congratulations on your blog award! Woohoo! With MM I didn't have to call during the middle of the night. Now with little Miss Harper Jane, I called one of my best friends at 2 in the morning. She asked me to and I was so uncomfortable but I had promised her that I would. And girl, it's not the heat, it's the humidity that is killing me! No, can't believe it is JUNE!! Where did the time go? The invites are SO cute!! I was induced, so I didn't go to the hospital in the middle of the night. But, I think that half of the free world was in the birthing suite with me. I had all of my girlfriends with me. Do you really not like to talk on the phone? Or, is it OK if people call you? I LOVE those invites! Very unique. And congrats on your award! What did you think of The Bachelorette? I like Jason...he seems sweet. My car told me it was 108 yesterday, but I don't think it got much higher than 91, this is in Orlando by the way. It's just hot way too soon. Then because it's June there is all this advertising for hurricane season. They have their predictions and everything, blah, blah, blah. I have no hurricane plan or emergency kit. I had some major contractions last night and got pretty excited, but nothing happened. My family wants me to call them when I have the baby and some want to be at the hospital when it happens, but I will not call friends in the middle of the night. I would send an email and call at a more appropriate time like 10am. But then again, I don't have a friend that is like a sister so it's different. Oh Kelly, LOVE the invites!! Can't wait until my shower! Even if you and I are the only ones that show up it will be a blast! I cannot believe it's June either - it's very hot here as well. I love the invitations - so cute! I really wish I could come to that shower! You and Hillary were so sweet to me and continue to be in the little blog world! :) Y'all going to San Antonio?? We can hook up there...come on!! I'll watch it later. Don't tell me. And...my babies all decided to wake me up at 5 in the morning. It was convenient and weird that they all had the same idea. I am glad you are doing well! I have been thinking about you a lot and praying for you. I am glad you and Scott were able to get away and relax. Congratulations on your blog award! You deserve it! I went into labor with EG at 3:00 a.m. Derek was gone in Iraq, so I called his dad to take me to the hospital. He was sooo nervous. I was sooo calm (I really couldn't believe how calm I was). It was quite funny. I only called my sister and my mom. I called everyone else after she arrived. What a blessing the relationship that you have with Laurie. I just adore how close you two are. I missed the Bachelorette last night! I'll be behind now. I guess it's the kind of show where missing one episode is okay though. I'll still know what's going on I guess...goofy guys acting crazy to go on a date. Was that what happened? Ha! Congrats on your blog award. I couldn't go a day without checking in on you. I love your blog. Oh, and those invites are so cute! We love your blog, you're always such an encouragement and you're so creative!!! I didn't have to call people when I went into labor, mine were induced.. but..I would have called the parents and siblings! We reached a record high of 106 yesterday. For the next 3 days we will have triple digit temps. Congrats on your blog award. I added chicken supreme to my list of meals for next week! It looks yummy!!! Those invites are really cute!! I did call my best friends when I went into labor and went to the hospital around 11:00 PM...then I called every few hours to update them!! I watched the Bachelorette too and I like Jason right now! He seems so genuine! Girl - we are in the heat in Tennessee too! We are supposed to hit 90 today and on top of that, it's MUGGY!!! Good 'ole Southern Summers - can't beat 'em! When Lauren went into labor she called me and Megan H in the wee hours of the morning! I was so excited - I called in a sub right away and headed to the hospital! What a wonderful day it was... Megan and I got to be in the delivery room with Lauren - it was absolutley magical... there are no words to describe the miricle of birth and watching parents lay eyes of their sweet little one for the first time! *tear*! We were literally sleeping with our cell phones under our pillows waiting for La to call! Being a part of Dawson's birth (Meag & I were there to make sure La laughed) was so magical, so touching, so amazing!!!! I adore the invites! They look like your colors...LOL! With our first kid, I didn't even bother waking my husband up at first. I just tried to stay calm in the bathtub until about 5:00 AM when I couldn't take it anymore, and then we left for the hospital and called everyone at a decent hour. With our 2nd, we had to call my parents because kid #1 was already in bed for the night. He was born early the next morning, so we didn't do the calling until after he arrived. Yum, Yum chicken supreme sounds good right now! I click on your link through Laurie's - she taught my girls art - (and just recently added you as a link on mine) and I enjoy it so much! I wanted to post recently when you said you read Lincee's Bachelor(ette) recaps because I love them...I've been reading them since she used to send them out in e-mails! Just had to tell you had another fan. You are so sweet Kelly. When I saw your comment that you couldn't pick one blog because you loved them all equally, for some reason, it reminded me of the kids in my kindergarten class. I love them all the same. So anyway, I could relate to that. :) And congratulations!! I always love reading your blog! And as far as the phone call from Laurie...I know you wouldn't have it any other way!! I definitely think good friends are on the "call anytime" list. That's what friendship is all about!! I agree with you completely...its HOT! I went to an outside wedding on Sat. and it was 96 here with surprisingly no wind. It was a tad bit miserable! Cute invites! The look like something you would love! We didn't have to worry about calling people since I was induced but I did give Kirk a list of people to call and update on progress. He did a great job! Congrats on your blog award!!! OH...i didn't know there were blog awards but you so deserve it. I can't tell you how much I love reading your blog...it encourages me, makes me laugh and makes me think...what more could I need in a blog. As for labor...didn't quite happen for me but I would of called...my bff called me at 10:30 to tell me her water broke and they were on the way to the hospital. hugs...heard today you are throwing another shower at your house...can't wait to hear about it too. I am so bummed! I used to be able to read Rachels blog about Mccoy but since she made it private, i cant!! I loved her blog!!! I LOVE the chicken recipe you make. We had it a while back and it is AWESOME!!!! GREAT BLOG! The chicken recipe sounds yummy! LOVE that invitation! 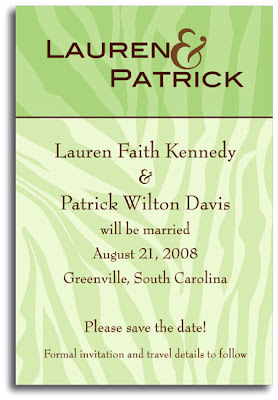 You can't go wrong with brown and green and zebra print! I went into labor around 3 in the morning with Drew. I called my parents and Seth called his parents. With Emma Kate, I was induced so everyone knew. I think it is so neat that she is calling you. I love going to that hospital to welcome a new baby. To *the* hospital. Whew... I need to go to bed.! Love the invites. We lived in WA when Brooks was born. Went in to labor during the afternoon and headed to the hospital about 1am. Called my parents to book a flight, and they arrived several hours after delivery. We didn't call friends b/c they were pregnant too! !